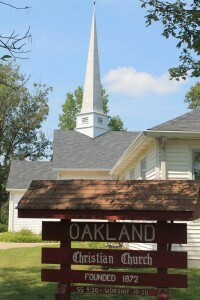 Oakland Christian Church is a country church at the north edge of sprawling Columbia Suburbia. We’re known best for our country charm and practices. For instance, during the harvest season, you may find locally grown produce on the Sharing Bench . . . and everyone is invited to help themselves. Worship is traditional, but informal (dress is casual). We’re used to children being a bit noisy . . . and since we value family, we’re don’t get annoyed when a toddler “escapes” mom’s grasp and makes it all the way to the pulpit in the middle of the sermon. Our minister is the Rev. Dr. Ronald L. Farmer. You can read more about him on our “staff” page. Although it should go without saying, we’ll say it anyway: you will be welcomed!